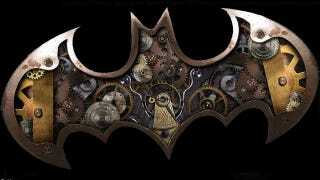 What would the steampunk Batman videogame have been like? A few days ago, Kotaku posted a gallery of concept art from a rejected pitch for a steampunk Batman videogame based on the Elseworlds comic Gotham by Gaslight. So what exactly did we miss out on? The Elseworlds comics are DC's alternate universe books, "What if?" scenarios featuring familiar superheroes. Gotham by Gaslight was the first Elseworlds book, and planted Batman in the Victorian era. The original Gotham by Gaslight story was written by Brian Augustyn, with pencils by Hellboy creator Mike Mignola. Artist Julie Farrell posted concept artwork from a Gotham by Gaslight game she was working on with Day 1 Studios (although you'll have to go to Kotaku to see the images, since Farrell was asked to take them down). Farrell's designs look pretty heavy on the steampunk, with plenty of brass and gears. I can't help but wonder how closely a Gotham by Gaslight game really would have followed the original story, which is a tightly written detective tale featuring Jack the Ripper, who has fled Whitechapel for Gotham City. (His timing really couldn't have been worse, since that's precisely when Bruce Wayne starts donning his cloak and cowl.) Augustyn and Mignola's Batman is also pretty light on the gadgets, a far cry from the clockwork batarang. Perhaps Farrell and Day 1 drew their inspiration from the Gotham by Gaslight follow-up, Master of the Future, which featured a supervillain with an airship and an automaton sidekick. Or maybe the Gotham by Gaslight videogame would have simply been a generically steampunk version of Batman that borrowed the Elseworld comic's name and featured steampunked versions of Batman's rogue's gallery. In that case, I still hope they would have borrowed some of Mignola's visual ideas — the leather-outfitted Batman with high-necked coat over his costume, and perhaps his strychnine-poisoned Joker with the rictus grin.